This article will review what personal lubricants are paraben free and which are not as well as why Parabens are so controversial. Did you know that the top selling personal lubricants in the world today may contain potential toxins in them? Brand names such as K-Y Jelly, Astroglide, Wet, I-D, System JO, Shunga and even party plan lines such as Passion Parties Romanta Therapy line are just a few of the lubricants that have been known to contain Parabens. These chemicals are absorbed by the skin and then spread throughout the body through the bloodstream. Parabens are known toxins that can contribute to a slew of health problems and are used as a germicide and preservative as they are cheap and effective. Commonly used parabens include methylparaben, ethylparaben, propylparaben and butylparaben. On 5-3-11 a ban was put into effect for phthalates, alkylphenols and parabens in consumer and professional products by the French National Assembly. Denmarks environmental ministry announced on 12-20-10 that it is banning two types of parabens: propylparaben and butylparaben in lotions and other cosmetic products for children under three years of age. As of 6-26-12 the EU announced an introduction of a ban on the use of parabens in skin care products for children under six months old. Parabens are known hormone disrupters, estrogenic (they mimic natural estrogens that have been shown to lead to cancer) and have been linked to breast cancer; skin rashes, heighten allergic reactions, decrease sperm count and cause problems to fetal development for pregnant women. There are those that argue that Parabens are not toxic because there have been limited studies proving the causality of cancer. However, the cancer risks of Parabens are not the most alarming of their health risks. It is the hormone disruption that is of great concern, which we will cover, however, first let's tackle the cancer issue. Parabens are used in personal lubricants to kill bacteria and do have toxicity to cells, which is cause for concern. Research has proven that Parabens were found in biopsies from breast tumors. In 2004 there was a study done in the UK that detected five types of Parabens in the breast cancer tumors of 19 out of the 20 women studied. This study, which was quite small, does not prove that Parabens cause breast cancer. However, it does demonstrate that there was a presence of Parabens that were intact in the cancerous tumors. This means that the body's metabolism was not able to alter them and that Parabens were able to penetrate the skin and remain in women's breasts. It should be said, that based on this small study regarding breast cancer, in the USA the Cosmetic Ingredient Review (CIR), the Food & Drug Administration (FDA) as well as the National Cancer Institute (NCI) have said that there is no conclusive evidence that Parabens cause cancer. However, they all concede that there is no conclusive evidence that it does not and that caution should be taken as more research on this is needed. Of greatest concern is that Parabens are known to disrupt hormone function, an effect that is linked to increased risk of breast cancer and reproductive toxicity. Parabens mimic estrogen by binding to estrogen receptors on cells. They also increase the expression of genes usually regulated by estradiol (a form of estrogen); these genes cause human breast tumor cells to grow and multiply in cellular studies. Parabens are known to mimic estrogen when introduced into the body and are thus considered endocrine disruptors. The Metropolitan Research Laboratory of Public Health in Japan has reported that exposure to butylparaben in particular negatively affects testosterone levels in the men. This means that it reduces sperm count in men and causes "feminization of boys." 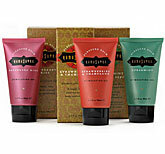 While paraben preservatives are typically a very small percentage of a personal lubricants formula they are very potent. Considering the lack of FDA testing and regulation regarding personal lubricants, we encourage consumers to use products with Parabens with caution and avoid them if they can. Because Parabens are so effective at preserving personal lubricants by reducing bacteria it means that products that contain these toxins do have a longer shelf life. Typically, natural and organic products that are Paraben Free and use more natural antibacterial ingredients only last six months to one year and should be disposed of after that time to avoid exposure to bacteria growth. However, most people find that they are most likely to have used up their personal lubricants before they would expire. To be safe, make sure to check your product labeling to ensure that you do not use something that has expired. What Lubricants Have Parabens & Which Do Not? We have put together a list of personal lubricants below based on their categories to help consumers identify what lubricants contain parabens and which lubricants are paraben free. There have been concerns among lubricant purists that propylene glycol is the same thing as antifreeze used it automobiles. The truth is that it is not the same thing propylene glycol is a form of mineral oil which is an alcohol produced by fermentation of yeast and carbohydrates; whereas antifreeze is ethylene glycol and is toxic to both animals and humans. The World Health Organization, CFTA (Cosmetic, Fragrance, and Toiletry Association) and the FDA (U.S. Food & Drug Administration) list propylene glycol as suitable for use in cosmetics and lubricants and when used properly it is considered safe for human use. Other names for propylene glycol are 1,2-dihydroxypropane, 1,2-propanediol, methyl glycol, and trimethyl glycol. So how did this rumor get spread? Propylene glycol used to be added to or even replaced ethylene glycol to reduce costs as a processing aid as it is an aliphatic alcohol that when used with ethylene glycol lowers the freezing temperature of water. However, it is important to note that the lubricants we carry so not contain ethylene glycol, rather they contain propylene glycol which is considered generally recognized as safe" for use in food and other products. It should also be noted that propylene glycol comes in different grades for different uses. When in the form of the industrial grade, propylene glycol is an active ingredient in antifreeze, engine coolants, airplane de-icers, paint, enamel, varnishes, polyurethane materials and solvents and it is when it is in the form of this grade that the Material Safety Data Sheet (MSDS) cites skin, liver and kidney damage that can result from contact. The pharmaceutical grade of propylene glycol is a much less concentrated form and is commonly used as a solvent in oral, topical and injectable drugs as well as in food. There have been extensive studies on propylene glycol and it has been shown that it does not cause cancer nor does it present a carcinogenic risk with low levels of ingestion. However, it should be noted that some people did find that they had allergic reactions from propylene glycol primarily in the form of skin irritation. 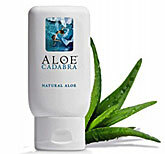 If you find that you are sensitive to propylene glycol there are certainly lubricants that do not contain it such as Aloe Cadabra. The real concern comes down to quantity of consumption of propylene glycol. When used in small amounts or used infrequently it most likely will not cause any negative health effects. There are of course alternatives so again should you want to avoid it you can certainly use personal lubricants that do not contain it. See our lubricant section where we always list ingredients so that you can avoid anything you may have a sensitivity to as even all natural plant based lubricants can cause allergic reactions in some people.